Is Your Data Really Gone? When you delete your files, empty your recycle bin, or clear your internet history, your data isn’t really gone. In fact with freely available tools (including our own products) you can fully recover deleted data. When you delete files, all that happens is your operating system removes the reference to your file from its internal directory but the file remains there. Over time, the data from your file may be written over and destroyed but there’s no guarantee that will happen. Take a look at the chart below to see if your “deleted” data is really gone. All WipeDrive products use the same certified disk-wiping technology to ensure your data is securely and permanently erased. Author etzbigjayPosted on February 6, 2017 Categories ComputersTags Computer, Computers, Data, WipeDriveLeave a comment on Is Your Data Really Gone? Many questions have really being buzzing on the Etisalat free browsing cheat, precisely for 2017, that it seems it is data capped or is it data capped? Or perhaps what is it about. IS THE ETISALAT FREE BROWSING CHEAT DATA CAPPED? The thing is that we have noticed that the Etisalat free browsing cheat 2017 is data capped, data capped means that the free browsing cheat has a megabyte or MB as some may put it; Limit. WHAT IS THE DATA CAP LIMIT FOR ETISALAT FREE BROWSING CHEAT? CAN THE ETISALAT FREE BROWSING CHEAT BE BYPASSED? Yes the etisalat free browsing cheat can be bypassed and so in this article i will be showing you how to bypass the etisalat free browsing cheat of 60MB. 1. Clear your Psiphon data and cache, from phone settings – applications. ent.nxtfwd.com/s/d/etisalat_ng#openModal when writing the new settings. 1. Clearing the Psiphon data and cache via your data usage. 2. Replace proxy server with any of the following links below. So guys, that’s all, if you have any questions or finding it hard or confusing in anyway, kindly ask questions via the comments section and i will guide you more. It really saddens me to announce that the MTN 7GB for N2000 I announced yesterday have been discontinued 😦 😦 :(. Turns out it was just a promo for the just concluded TechPlus event held in Lagos. The event lasted from 21st – 23rd of July that was also how long the promo lasted. So, if you’re planning on subscribing to the 7GB for N2000 Plan, I advice you use your money for something else. MTN unveil this plan this week at the Africa’s Biggest tech event in Lagos-Nigeria by TechPlus .. Normally, 3.5GB data goes for N2000 ; but this time, MTN at TechPlus applied the multipliers effect that gives you 7GB of data for just N2000. I know you love it when you get big data for lesser amount. This is exactly 100% bonus. It is a new plan, a new deal for those who think they value the use of data. Will it Work on My Device? Yes, it will work on all eligible devices including the un- repented Symbian phones. 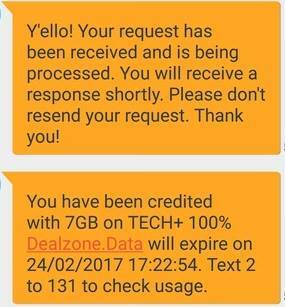 Text 2016 to 131 and you’ll receive a message that you have been credited with 7GB on Tech 100% Dealzone. But do you know what…. You can even get upto 11GB with your N2000… Ask me How? It’s simple. MTN is currently on weekend promo called WoW Weekend . This is how wow weekend works, when you recharge any amount, you get free data e.g, when you recharge N200, you get free 100MB. When you recharge N500 and above, you get free 1GB. Load your line with MTN airtime of N2,000 and you’ll get free 2GB usable only from Friday to Sunday. You can then use your N2000 to get 7GB of data making it 11GB. It is time to choose which network is your best when it comes to data. Do drop your comments below for feedback. Well I thought it was all my fault that got me such, but due to massive complains from my friends and readers both offline and online, so I went for a research. Here I have some write up about all you need to know! Do you really know as an MTN customer on the XtraSpecial, XtraPro, BetaTalk, Trutalk, etc tariff plans, you may have recently noticed that you no longer get your regular bonus data on recharge. Well the reason for that is that it has been discontinued. This applies in equal measure to the weekend data bonus on recharge for the other tariff plans. However iPulse customers, StartPack, Supersaver+ and SmoothTalk Plus customers will still continue to receive the data bonus on recharge applicable to them. However, you should also know that some MTN Tariff plans are still eligible for this data bonus offer e.g old tariff and StartPack plans. Etisalat Nigeria presents its best yet innovative product which ensures that you the customer can make the best of the Etisalat network. In its typical style of using innovation to simplify the lives of its consumers, Etisalat has rolled out the stylish, classy and easy to use “EasyMobile App”. The Etisalat EasyMobile is free to download from Apple App store or Android Play store. And one thing about the Easymobile is that, your data does not get charged when you use the app. With the EasyMobile app, you will get instant live support – buy airtime and data with debit card – opt-in and opt-out of services – find etisalat store near you. With EasyMobile, customers can easily manage their etisalat account and services. Easy mobile provides a simpler, easier and faster way of getting things done without the need to remember or dial access codes. Etisalat has really more much improvement to this EasyMobile App, they have enhanced it with many other features. EasyMobile App is a mobile application that allows you flexible control of your data plans, purchase data, transfer data and check your account balance on smart devices. And it is available on Google Playstore, Blackberry world and Apple Store, so they got all the Phones devices covered! 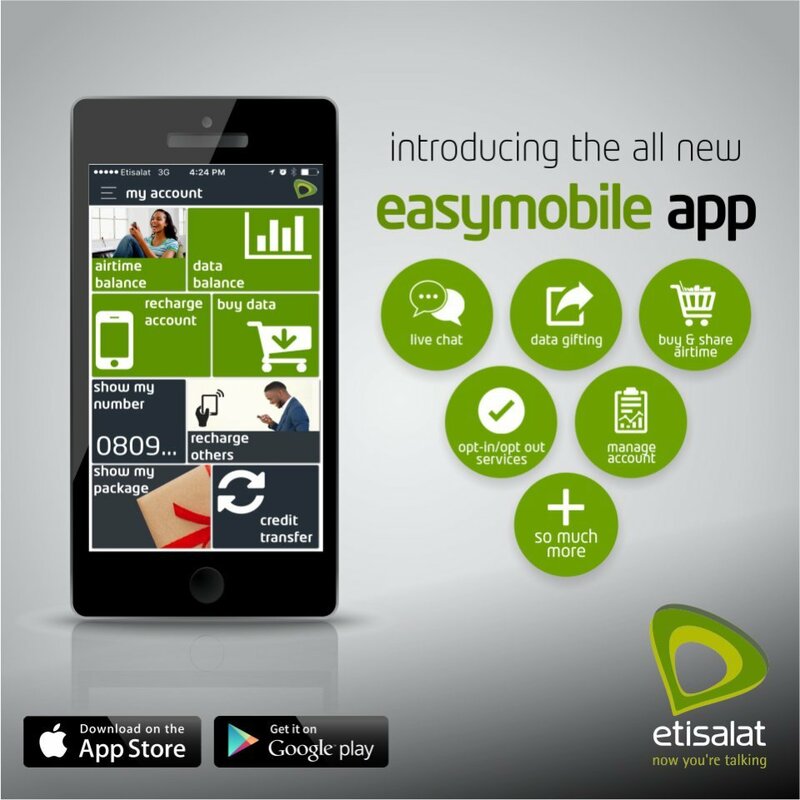 Etisalat made easymobile app to be more enhanced, you can now check your data balance, buy data, transfer or gift data. The EasyMobile App boasts of a simpler, easier and faster way of getting things done on the Etisalat network without the need to remember, text or dial codes to access services. This App can be personalized to reflect ownership and what’s more, the App is zero rated, which means you do not need data to use it. You can also purchase airtime directly from the app using your debit card and access instant live support. All these and more are contained in the EasyMobile App. Etisalat EasyMobile app, has been created for all phone device, including Blackberry, Android, Apple, iPhones and the rest of them. Click Here to download from android playstore. Do you notice about the new MTN WowWeekend free data bonus? it’s cool and if you haven’t gotten yours, or you have abandoned your MTN sim, just look for it and check it out if you receive any message of such and recharge your sim according to how the message instructed and you will be credited instantly with the Data bonus. Most MTN Pulse users stand a chance of receiving 1GB or more. Most MTN BetterTalk users stands a chance of receiving 100MB. check the screenshot for pulse 1GB below. I got the message and decided to give it a trial today by recharging with N200 on my MTN BetterTalk sim card and was given 100MB. Are you interested in this weekend bonus? Recharge your MTN sim now with N200 and above to get yours. NOTE: Your airtime will still be intact!